A tutorial showing how to plot Amazon AWS Redshift data with Plotly. This notebook will go over one of the easiest ways to graph data from your Amazon Redshift data warehouse using Plotly's public platform for publishing beautiful, interactive graphs from Python to the web. Plotly's Enterprise platform allows for an easy way for your company to build and share graphs without the data leaving your servers. In this notebook we'll be using Amazon's Sample Redshift Data for this notebook. Although we won't be connecting through a JDBC/ODBC connection we'll be using the psycopg2 package with SQLAlchemy and pandas to make it simple to query and analyze our data. requests.packages.urllib3.disable_warnings() # this squashes insecure SSL warnings - DO NOT DO THIS ON PRODUCTION! You'll need your Redshift Endpoint URL in order to access your Redshift instance. I've obscured mine below but yours will be in a format similar to datawarehouse.some_chars_here.region_name.redshift.amazonaws.com. Connecting to Redshift is made extremely simple once you've set your cluster configuration. This configuration needs to include the username, password, port, host and database name. I've opted to store mine as environmental variables on my machine. As I mentioned there are numerous ways to connect to a Redshift databause and I've included two below. We can use either the SQLAlchemy package or we can use the psycopg2 package for a more direct access. Both will allow us to execute SQL queries and get results however the SQLAlchemy engine makes it a bit easier to directly return our data as a dataframe using pandas. Plotly has a tight integration with pandas as well, making it extremely easy to make interactive graphs to share with your company. This next section goes over loading in the sample data from Amazon's sample database. This is strictly for the purposes of the tutorial so feel free to skim this section if you're going to be working with your own data. conn.commit() # make sure data went through and commit our statements permanently. Now that we've loaded some data into our Redshift cluster, we can start running queries against it. We're going to start off by exploring and presenting some of our user's tastes and habits. Pandas makes it easy to query our data base and get back a dataframe in return. In this query, I'm simply getting the preferences of our users. What kinds of events do they like? Now that I've gotten a DataFrame back, let's make a quick heatmap using plotly. This graph is simple to produce and even more simple to explore. The interactivity makes it great for those that aren't completely familiar with heatmaps. Looking at this particular one we can easily get a sense of popularity. We can see here that sports events don't seem to be particularly popular among our users and that certain states have much higher preferences (and possibly users) than others. A common next step might be to create some box plots of these user preferences. It seems to be that sports are just a bit more compressed than the rest. This may be because there's simply fewer people interested in sports or our company doesn't have many sporting events. Now that we've explored a little bit about some of our customers we've stumbled upon this sports anomoly. Are we listing less sports events? Do we sell approximately the same amount of all event types and our users just aren't drawn to sports events? We've got to understand a bit more and to do so we'll be plotting a simple bar graph of our event information. It's a good thing we started exploring this data because we've got to rush to management and report the discrepancy between our users' preferences and the kinds of events that we're hosting! Luckily, sharing plotly's graphs is extremely easy using the play with this data link at the bottom right. However for our report, let's dive a bit deeper into the events that we're listing and when we're listing them. Maybe we're trending upwards with certain event types? Overall it seems inconclusive except that our events seem to be seasonal. This aggregate graph doesn't show too much so it's likely worth exploring a bit more about each category. It's always great to try and better understand which graph type conveys your message the best. Sometimes subplots do the best and other times it's best to put them all on one graph. Plotly makes it easy to do either one! The above subplots seem to tell an interesting story although it's important to note that with subplots the axes are not always aligned. So let's try plotting all of them together, with lines for each category. This looks much better and explains the story perfectly. It seems that all of our events are fairly regular through the year except for a spike in musicals and plays around March. This might be of interest to so I'm going to mark up this graph and share it with some of the relevant sales representatives in my company. The rest of my team can edit the graph with me in a web app. Collaborating does not require coding, emailing, or downloading software. I can even fit a function to the data in the web app. 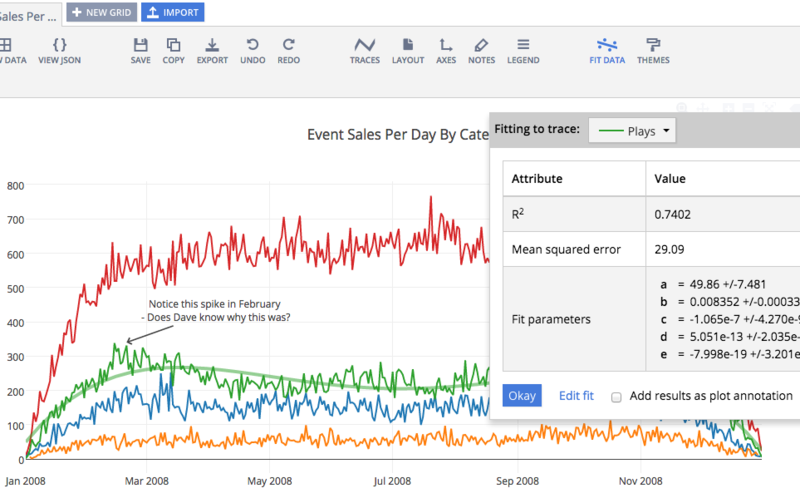 Plotly makes it easier for data analysts and data scientists to share data in meaningful ways. By marking up drawings and embedding comments on the graph, I can make sure that I'm sharing everything within a context. Rather than having to send a static image, I can share an interactive plot a coworker can explore and understand as well. Plotly makes it easy for companies to make sure that information is conveyed in the right context.